Do I need to make payment online when I place an order at Difeee website? What's the procedure afterwards? You do not require to make immediate payment when placing an order at Difeee website. Our specialist will contact you within 48 hours to confirm your order and arrange timeslot for inspecting your diamond. If I make a purchase online, am I confirmed to make the purchase when I visit your showroom? Once we have received your order, our Diamond Consultant will contact you to confirm your order, stock status and make appointment within two working days. However, we also understand that not every customer may be able to visit us within one to two working days. If the selected diamond(s) are sold during this time or there is a delay due to special circumstances, we will proactively notify affected customers, allowing customers to make appropriate arrangements. Can I visit your showroom to buy diamond(s) without making an appointment? Yes, there are more than one thousand certified GIA loose diamonds, two hundred GIA diamond rings and diamond jewelrys available for your choice. 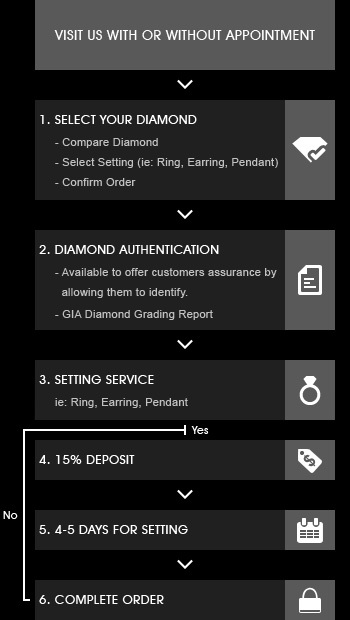 Do I have to purchase the diamonds selected online? No, we will arrange similar diamonds for you to compare when you visit us so you can compare and make the right choice by seeing the diamonds first. Do I have to make the purchase decision after inspecting and comparing the diamonsd at Difeee? No, but due to the high turnover of Difeee's diamonds, we will only reserve the diamonds to the next working day. Don't miss the chance to purhcase your favorite diamonds! What payment methods does Difeee accept? I don't have much knowledge about diamonds, how can you help? You can contact us directly through our inquiry hotline, email, Whatsapp or our Enquiry Page.